Wed, 24-Apr-2019 - 19:14:15 ---- The fact: 42.844.000 visitors done. There are many variables that affect the size and shape quality of roll formed metal profiles. First, the physical properties of the metal vary according to the metal chemistry and processing history. The same metal specification from different suppliers, and even different lots from the same supplier, can vary in yield strength, tensile strength, elongation, elastic limit, ductility, hardness, and surface texture. Strips slit from different positions on the same coil can have differences in crown or camber, and may behave differently in the roll forming operation. In some cases profiles may run continuously for days or weeks. A stand will be set up based on the physical properties of the first strip, but subsequent strips will vary in width, thickness, crown, camber, and physical properties. This can cause profiles to go out of specification during a run, requiring the setup technician to periodically adjust rollers to compensate for the material changes. Long runs are often checked for quality by taking a sample every half-hour. When a problem is identified several hours of production may be quarantined pending manual inspection to isolate the out-of-specification material. Complex profiles may be produced on lines with 20 to 30 passes, which can take between 12 hours and 18 hours to set up. During the assembly of the stand each progressive stage is checked for geometrical accuracy by running a sample strip. Checking is done off-line, and turn-around for a check may be 10 minutes to one-half hour. During the set-up, the technician is under pressure to make the fewest number of adjustments in order to reduce the downtime. There are several methods for checking profile dimensions. Profile samples are often checked in a metrology lab using Coordinate Axis Measurement Machines (CMM). Typical systems utilize contact-stylus sensors to touch the profile at numerous points, compare the points to a standard, and report deviations. Another approach is to cut a short section, fill it with a Room-Temperature Vulcanizate (RTV) Compound, cut a thin sliver from the profile, and inspect it on an optical comparator. The RTV keeps the profile from distorting during the cutting operation. Both of these methods are time consuming, and result in a time lag between rolling the sample and getting back the dimensional results. New technology introduced by Bytewise permits key profile dimensions to be monitored continuously, in real time, on-line, using laser triangulation profile sensors. This enables immediate feedback to the set-up technician during assembly of the stand. It also provides an alarm to alert the operator when any dimension changes beyond the allowable limit, something that often occurs as a result of strip change. It provides an immediate feedback to the technician for incremental roll adjustments, so he can make smaller and more frequent adjustments and see the effect immediately, without waiting for off-line checks. 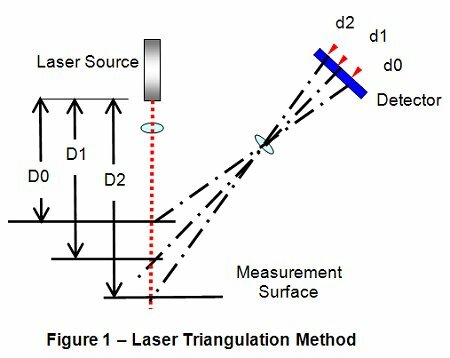 Laser triangulation is a method of distance measurement. As shown in figure 1, a laser light source projects a point of light onto the measurement surface at distance D1. The laser light is reflected at angle ? through a lens and onto a detector at position d1. When the measurement surface is positioned closer to the laser source at D0, the reflected light falls on the detector at position d0. When the measurement surface is positioned farther from the source at D2, the reflected light falls on the detector at position d2. The range of the D2-D0 can be scaled to the range across the detector d2-d0 so that the detector output correlates to the actual distance between the sensor and the measured surface. Early laser triangulation sensors used analog devices such as gallium arsenide to detect the change in position of the reflected laser light. These came to market in the 1970's and are referred to a Position Sensitive Detectors (PSD). PSD's output a varying voltage or current proportional to the position of the light on the detector. Charge Coupled Devices (CCD) are now in wide use as detectors. CCD's are light sensitive microchips of the type used in digital cameras. A CCD detector may contain, for example, 1024 pixels that result in a detector resolution of 1024 parts across the measurement range. In the mid-1990's, Bytewise Measurement Systems and others developed profile triangulation sensors that substituted a laser line source for the laser point source, and substituted a 2-dimensional CCD array in place of the single-axis pixel array. This is illustrated in Figure 2. 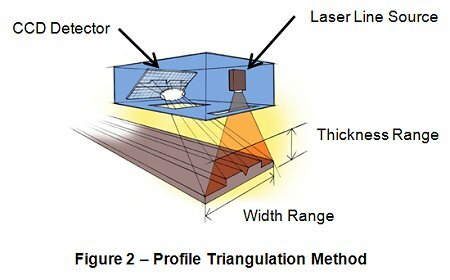 A profile triangulation sensor using a one mega pixel detector (1024x1024) could now acquire data comparable to 1024 fixed-point laser triangulation sensors. These were marketed as "sheet of light" laser sensors. These sensors could acquire a single profile of 1024 points at frequencies between 5 and 10 samples per second, which is suitable for on-line rubber extrusion measurement. Note that Complimentary Metal-Oxide Semiconductor (CMOS) detectors are used in place of CCD detectors where higher frequencies are required. CMOS detectors achieve frequencies of 2,000 to 8,000 Hz in similar applications. Multiple profile triangulation sensors can be combined into a fixed frame to view the outside profile of the extrusion. The sensors each take a snapshot simultaneously. 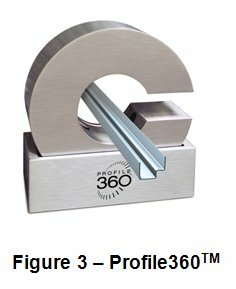 The profiles are transformed into a common co-ordinate system and sent to a "measurement server" software component that performs a best-fit match to a reference measurement or CAD template. As a result, the profile can move up and down, side-to-side, and rotate with no affect on the matching routine. 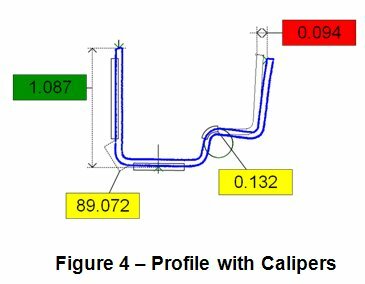 Virtual calipers allow for key dimensions of the profile to be extracted. Target and tolerance values are associated with each key dimension. Numerical outputs are available from the virtual calipers as analog signals, RS232 data records, or PLC network interfaces. The measurement server results are made available for distributed operator interfaces. Multiple operator interfaces can be running on Win32 platforms showing the current measurement results. This allows the operators at both ends of the process line to see the current measurements. Supervisory and engineering personnel located throughout the facility with network access to the measurement server can also see the measurements. The operator interface software presents the cross-section template (either a CAD or reference measurement data), the measured profile, and virtual calipers. Additionally, a powerful "on-line comparator" view can be enabled which shows the deviation from the current measure and the template. A vector from each measurement point to the nearest template point is established. This vector is then drawn with a magnification factor that allows it to be visualized on a higher scale than the raw data. The error vector is color coded with green, yellow, and red to indicate tolerance conformance. Different tolerances can be established for each segment of the template. Sensor systems consist of the sensor, power supply, cable, data acquisition card, PC, and software. 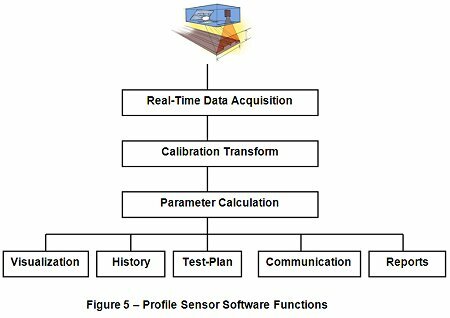 Software can be divided into several functions including real-time data acquisition, calibration transform, parameter calculation, visualization, test-plan management, data history management, reports, and external communications, as shown in Figure 5. Real-Time Applications take a single profile, perform a calculation to extract measurement values, and output the measurement values for visualization, grading decisions, and automatic feedback. This is done at the sensor frequency. Resolution is defined as the smallest dimensional change that can be recognized. Resolution for the Bytewise profile sensors is 0.001mm, or one micron, in the thickness axis. Width resolution is 0.2% of the width FOV. Accuracy is a function of sensor resolution, system design, and analysis method. Accuracy for multi-sensor systems varies from 0.05% for the full scale FOV, to 0.2% of the FOV, depending on system characteristics. Empirical accuracy has been established for a 150mm wide FOV sensor. A multi-step certified gauge block was used for all measurements. This gauge block provided for 16 thickness parameters and 4 width parameters for a total of 20 measurement parameters per test. All measurements were repeated 75 times for each parameter. All measurements (20 parameters times 75 repetitions) were repeated at 9 locations within the field of view of the instrument. Positions were right, center, and left in the horizontal axis, and top, middle, and bottom in the vertical axis. Error of Measure is a means to express the capability of the measurement system that includes both the bias and repeatability components of variation. EOM encompasses the 99% confidence interval. EOM = Bias (absolute value) + 2.515 ? The EOM was calculated for each parameter at each location. The 9 resulting EOM's for each parameter were averaged to yield an average EOM for each measurement parameter. The EOMs for the 16 thickness and 4 width parameters were averaged together to yield an average thickness EOM and an average width EOM. The Average Thickness EOM was 0.023mm. There is a 99% certainty that a thickness measurement is within 0.023mm of the true value. The Average Width EOM was 0.14mm. There is a 99% certainty that a width measurement is within 0.14mm of the true value. The worst case of the 9 EOM values was approximately two times the average. This shows measurement of four corner radii, the overall width, and three channels of thickness. The measurements were taken after seam-welding. On-line measurement can be used to quickly validate the roll stand setup. The setup technician can make progressively small roll adjustments and immediately see the result. This can cut the set-up time by eliminating the time-consuming off-line checking process. On-line measurement can be used during the startup of any run to assist in reducing the time required to reach stability. This information can be used to optimize the setup. On-line measurement can be used to continuously monitor the dimensional quality of any profile, and alarm the operator when any problem occurs. On-line measurement can be used to produce data histories that can be used to compare any run with its historical performance, and quantify quality improvement initiatives. 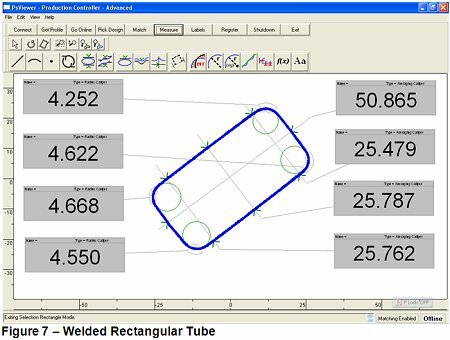 On-line measurement can be used to assist tooling development. Snapshot files can be exported as dxf point files that can be opened in the die design CAD application and compared to the intended design. - Addr: 1150 Brookstone Centre Parkway, Columbus, GA 31904 U.S.A.